The first goal of our school is to live and teach the Catholic doctrines of Jesus Christ. Our second goal is to offer a fine academic program. We believe that these two goals compliment one another, working together to form the whole person. The multi-faced Language Arts Program is organized and taught in self-contained classrooms in the primary grades and departmentalized in the upper grades and junior high. Science is taught using the Harcourt Science Series in grades 1-5 and Glencoe Science Series in grades 6-8. Field trips, videos, speakers, individual and group projects are regularly used to supplement the Social Studies curriculum. 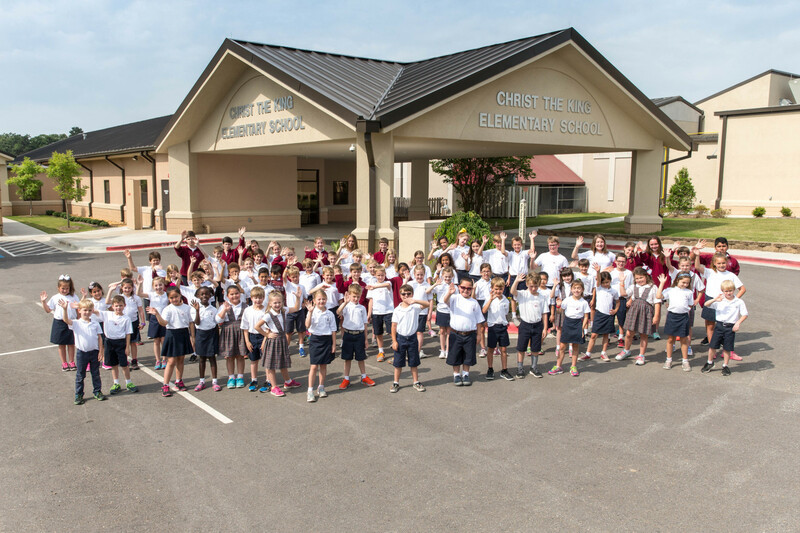 Mathematics education at Christ the King School begins at the concrete level and progresses to the abstract level. Computer software and manipulatives are often used to supplement math instruction. In addition to computer instruction in the lab, all classrooms are equipped with Chromebooks, interactive whiteboard technology, wifi and surround sound. P.E. is taught to Pre-K - 8th grade students every week. Our athletic programs are available to all students in the eligible grade levels. We provide an opportunity for all interested students to learn good sportsmanship and teamwork as well as to improve in the basic skills of the sport. Every student receives art instruction each week beginning in Kindergarten. Our students have produced award-winning art at the state level each year. Our full-time music teacher provides instruction from Pre-K - 6th grade. Students gain performance experience through the Pre-K Program, Kindergarten Circus, 1st Grade Christmas Pageant, 3rd Grade Caroling and 5th Grade Stations of the Cross. Each child from Pre-K - 8th grade is provided with Spanish instruction from a certified teacher. We strive to provide a strong foundation for future study of Spanish.